The security service business relies heavily on the latest technology to keep people safe. To provide customers state-of-the-art services, you need to secure some state-of-the-art technology for yourself. 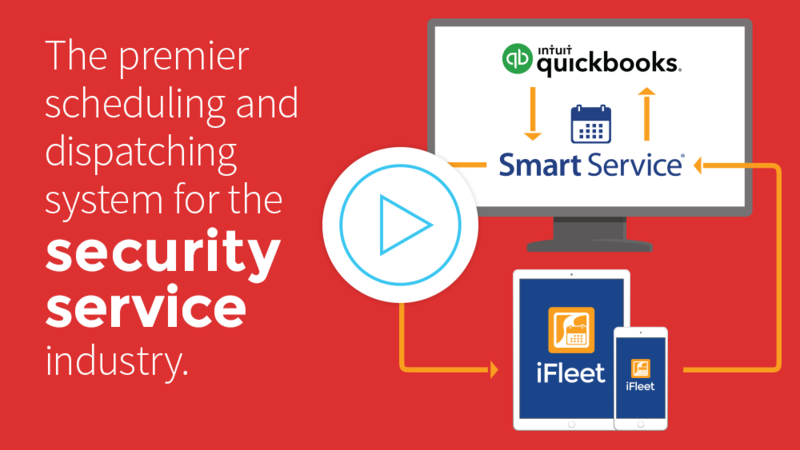 Enter Smart Service, the QuickBooks-integrated security service scheduling software taking the industry by storm. You already use QuickBooks. Why throw away what works? Smart Service is a direct QuickBooks add-on that bestows the accounting software with scheduling, dispatching, estimating, and time tracking abilities (to name but a few features). Make a move in Smart Service security scheduling software, and that work instantly shows up inside QuickBooks. Keep things simple! Learn more. With Smart Service, you can start to streamline, optimize, and automate every aspect of your security service business. Schedule work with an easy-to-use drag and drop scheduler. Make estimates in the field with a few simple swipes. Track the time spent in production for billing and payroll purposes. With Smart Service security service dispatch software, you have hundreds of awesome tools at your disposal. Learn more. The best thing about Smart Service security business software? The mobile app. Give your technicians the power to access their schedules on a smart phone or tablet. Give them digital, fillable forms. Let them fill out an electronic work order while they work, then collect a signature at the end of the job. A flick of a finger sends completed paperwork back to the office, where your administrative team can post a quick invoice. Get paid in record time! Learn more. Read the things successful business owners say about Smart Service. Level up your security service business!